"A comforting combination of cinnamon, raisins and brown sugar fill Pepperidge Farm® Puff Pastry Sheets that are rolled up, sliced and baked until the filling is warm and the pastry is flaky and golden. " Thaw the pastry sheets at room temperature for 40 minutes or until they're easy to handle. Heat the oven to 375 degrees F. Lightly grease or line a baking sheet with parchment paper. Stir the egg and water with a fork in a small bowl. Put baking cup liners in 12 (2 1/2-inch) muffin-pan cups. Put the raisins in another small bowl and pour hot water over them to cover. Let stand for 5 minutes. Drain. Add the brown sugar and cinnamon and toss to coat. Unfold 1 pastry sheet on a lightly floured surface. Spoon half of the raisin mixture on the bottom half of the pastry to within 1 inch of the edges. Brush with the egg mixture. Starting at the short side closest to you, roll up like a jelly roll, pressing seam gently to seal. Tuck in the ends to seal. Brush with the egg mixture. Place seam-side down on the work surface. Cut into 6 (2-inch) slices. Place the slices, cut-side down into the prepared muffin-pan cups. Repeat with the remaining pastry, raisin mixture and egg mixture. Brush with the egg mixture. Bake for 25 minutes or until golden. Remove the pastries from the muffin-pan cups and cool on a wire rack for 5 minutes. Serve warm. 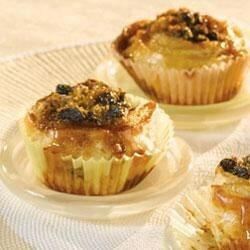 These tasty apple morsels are an elegant alternative to traditional pie.